Shaker cabinets are incredibly versatile. Cabinets are one of the most important factors to consider when planning a new kitchen design. As one of the most visible design elements in your kitchen, it’s worth investigating various cabinetry door styles to find something that will look good, perform well, and fit in with your budget. Whether you’re looking for something elaborate or simple, there’s a door style for every kitchen design. Here are just a few of the most popular kitchen cabinetry doors on the market. Shaker Doors – The most common door style in kitchens today, Shaker cabinets get their name from the distinctive Shaker furniture style that emphasizes utility combined with simple, clean lines. The shaker style is characterized by a five-piece door with a recessed center panel. They became popular largely due to their versatility, and lend themselves well to just about any decor, whether contemporary or transitional. Shaker cabinetry doors can also accommodate a wide variety of budgets and aesthetic preferences depending on the wood species, finish, and surrounding moldings that you choose. Louvered Doors – Although horizontal wood slats are typically used on windows and furniture pieces, they can add a distinct architectural style to kitchen cabinetry. Because the louvered doors have spaces between each slat, they are an excellent choice for cabinets that need ventilation. Some doors are true louvered allowing ventilation while others just have a louvered aesthetic. Raised Panel Doors – Raised panel cabinets have an air of ornate elegance and make cabinets look more like furniture. This cabinetry door style features a raised center panel with a profile or contour, imbuing the door face with a three dimensional look. Some raised panel cabinets will have a simple frame work around the edges while others boast a stepped frame or applied moulding. Flat / Slab Panel Doors – If you’re just looking for something minimalist and functional, you can’t go wrong with flat-panel cabinetry doors. These cabinets are trending in contemporary and modern kitchen design due to their clean, hard lines. They’re also super easy to clean. Flat panel doors often come in both wood veneers and decorative laminate options, in addition to a wide range of colors and sheens. Need new Kitchen cabinets? We’re featuring a special Wood-Mode savings event until December 30th. Don’t hesitate to give us a call at (800) 211-8394. 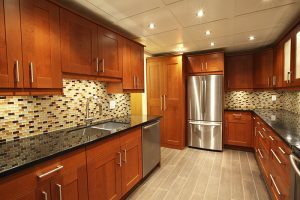 Since opening its doors in 1974, Kenwood Kitchens has made a name for itself throughout Maryland as a complete kitchen and bathroom remodeling firm. With showrooms located in Lutherville, Abingdon, Columbia or Annapolis, Maryland, Kenwood Kitchens is the place for all of your kitchen and bathroom needs. This entry was posted on Wednesday, October 5th, 2016 at 10:14 am. Both comments and pings are currently closed.